WITHIN TEMPTATION have released a live video clip for the track “Covered In Roses” and is now available for viewing right HERE. 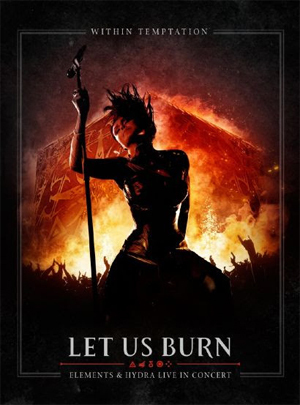 “Covered In Roses” is one of many career-defining songs that grace the upcoming Let Us Burn: Elements & Hydra Live In Concert DVD by Dutch symphonic rockers WITHIN TEMPTATION, due out in the U.S. this November 24th. Shot & recorded in front of 15,000 fans at the Sportpaleis in Antwerp, Belgium in 2012 and at the last show of their European Hydra arena tour at the Heineken Music Hall in Amsterdam, the Netherlands, the Let Us Burn DVD captures two dynamic evenings in sold-out arenas where the band performs their most requested compositions plus new music from their latest Billboard-/world-charting album, Hydra. Captured in high-definition with pro audio mixed in 5.1 Dolby Surround Sound, the formidable live reputation of WITHIN TEMPTATION’s stunning performances - complete with dazzling on-stage imagery and special effects (including fire-breathing dragons) - are showcased and brought to life. All versions are available for pre-order now at the Nuclear Blast USA Webshop.